Anthony Calf (Nikolai) and Joshua James (Arkady). Photo by Johan Persson. Nineteenth-century Russian novels are rarely light or bittersweet, yet this new interpretation of Ivan Turgenev’s Fathers and Sons aims to let some air into the tragic tale of generations divided by politics and propriety. Director Lyndsey Turner and playwright Brian Friel push the darker aspects of the book into the background and go hunting for comedy and lyricism, an approach that works often and helps temper the story’s inherent melodrama. The play opens in the Kirsanov’s country house with the servants preparing for the return of Arkady, a student in St Petersburg played with a good mix of heart and intelligence by Joshua James. His homecoming is complicated, however, by the friend he brings with him: haughty Basorov, a cold-hearted intellectual who refuses to believe in bourgeois trifles such as duty and love (a smart turn by American actor Seth Numrich). Soon the parents’ joy clashes with the young men’s itchy nihilism and out of the listless summer atmosphere emerge arguments, deception and odd flashes of violence. For much of the time, the gently comic atmosphere deceives the audience into thinking that all the hot-blooded words might not have repercussions as long as the fathers indulge their sons, but this is a Russian novel and, naturally, the cabbage soup soon curdles. The two strong central performances are buttressed by well-judged support with three characters in particular threatening to upstage the main duo. Tim McMullan as priggish Uncle Pavel and Susan Engel as grumpy Princess Engel are both very funny, while Karl Johnson adds a note of raw poignant melancholy as Basorov’s father, Vassily. Rob Howell’s production design is handsome with a set resembling a mouldering summer house made up of tumbledown timbers. Its artfully-angled composition adds an expressionist ambience which helps frame the conversations about politics and revolution. Friel mercifully keeps the grand-standing to a minimum and balances the idealistic ranting against the other elements of human drama, which means the play both grips and entertains throughout. His dialogue can feel a bit idiomatic and familiar at times – it might have been interesting to hear the Russian equivalent of phrases like ‘plenty more fish in the sea’. But the lines are clear and a well-timed bit of humour is never far away. Princess Engel gets the biggest laugh of the night when she snaps at a passing pleasantry about the weather: "I detest every month!" thus outdoing the young men’s nihilism and underscoring this play’s apparent thesis: that order and nicety must exist, if only as a bourgeois coping mechanism. 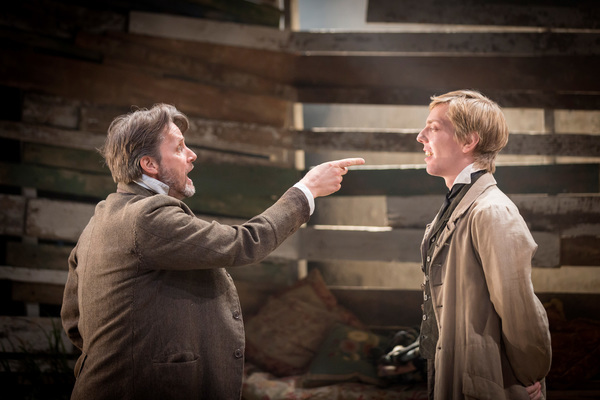 Fathers And Sons is on at the Donmar Warehouse until 26 July 2014. Londonist saw this play on a complimentary ticket.